The Lecturer in Computational Geosciences, Dr. Eric Parteli, offers courses on fundamental and advanced skills in the field of Computational Geosciences for students of the entire department. The courses are described below. Dr. Parteli also offers projects for Bachelor, Master and Doctoral Theses in the field of Computational Geosciences. 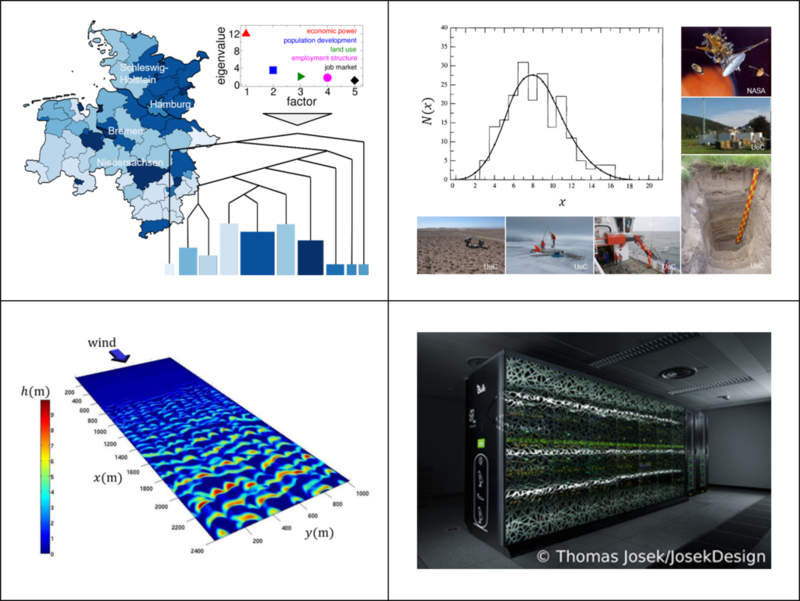 For further information please visit the webpage of the Computational Geosciences working group. Computational Geosciences is implementing a new course on Data Mining & Practical Machine Learning techniques for geoscientists, including a practical lab. Description: The course shall present to participants, by means of tutorials and hands-on sessions, tools and techniques to capture and store vast quantities of data; find patterns, trends and anomalies in large datasets; summarize data with simple quantitative models; automatically extract models from data, and validate the extracted models. Contents (not exhaustive): Structural patterns, Machine Learning and statistics, introduction to concepts, instances and attributes, knowledge representation, decision trees, algorithms (Bayesian models, association rules, instance-based learning, linear models and clustering), evaluation, implementations and transformations. A JAVA-based Graphical-User-Interface software is being planned for the practical labs. Pre-requisites: Basic knowledge of statistics is required, and you will profit the most from the course if you bring experience with data analysis from your research. The course is primarily intended for Master students and/or Doctoral candidates. Contact: Please contact Dr. Eric Parteli (eric.parteli(at)uni-koeln.de) if you want to attend to the course, thereby informing: Institute, working group, title of research, highest academic degree, know differentiation / integration (yes/no), know any programming language (if yes, which?). Description: The tutorial provides a platform for students from the entire Department to discuss mathematical and numerical methods in Computational Geosciences that are relevant for their research projects. The discussions will take place in small groups and may be complemented with short courses offered by the lecturer in Computational Geosciences. Pre-requisites: The student should be involved in at least one research activity within the Department, and the aim of using the Computational Geosciences method(s) should be to solve a specific problem in the scope of the student's research activity(ies). Please note that in this tutorial, the themes of the discussion rounds and the courses will vary according to the computational methods and the research topics. Therefore, please send an email to eric.parteli(at)uni-koeln.de with a short description of your computational geosciences problem *in advance* for appropriately scheduling your participation. Description: Any measurement, however careful and scientific, is subject to some uncertainties. This course aims at providing the students with knowledge of mathematical techniques to study and evaluate these uncertainties. In particular, the main functions of the error analysis are to estimate how large the uncertainties in a given measurement or calculation are and to evaluate what can be done to reduce these uncertainties, when necessary. In the course, particular focus shall be given to error propagation and tests of statistical significance of experimental data. The course will cover enough derivation to justify and understand the equations, but will emphasize methods and examples more than theory. Examples in lectures and exercises shall focus on geoscientific applications. The students shall acquire the ability to successfully apply error analysis in their research activities and scientific works in the Department of Geosciences. Detailed list of contents is available in KLIPS 2.0. Pre-requisite: Knowledge of partial differentiation and multiple integration, and knowledge of programming in MATLAB (minimum is knowledge of how to program for loops, as well as operations with vectors and matrices). Literature: Bevington, P.R., Keith Robinson, D., Data Reduction and Error Analysis for the Physical Sciences, McGrawHill, 3rd edition (2002); Taylor, J.R., An Introduction to Error Analysis: The Study of Uncertainties in Physical Measurements, University Science Books, 2nd edition (1997), among others. Location / time: Please check course availability and schedule in KLIPS 2.0. GSGS students can register via email to eric.parteli(at)uni-koeln.de. The lectures will cover a brief theoretical introduction that is essential to understand the different statistical methods, but emphasis in the course will be given to implementation/application of these methods with R, examples from different geoscientific areas, and interpretation. Interested participants will be offered a project on correspondence analysis and seriation for geochronology. Pre-requisites: All members of the Graduate School of Geosciences (GSGS), Cologne, who are interested in using R for statistics and data analysis can participate. However, some experience with basic statistics is important to follow the course. This experience may have been gained, for instance, from a bachelor/master course that involved basic aspects of statistics. To register: Please register your interest in this course by sending an e-mail to gsgs-admin@uni-koeln.de with your name and the course code (2017_T12R). Please note that the maximum number of participants is 20. This course consists of an introduction to numerical simulations by means of the Discrete-Element-Method (DEM), practical exercises and project. The course includes training in High Performance Computing to perform the DEM simulations. Pre-requisite: The participant should have knowledge of at least one programming language. Computational Geosciences contributes a lecture on Quantitative Methods in Environmental Archaeology for the Master Dialog in Environmental Archaeology. Workshop Description: The widespread use of machine learning (data-driven artificial intelligence algorithms) is rapidly reshaping the research landscape both in industry and academia. This two-day workshop is aimed at climate scientists and meteorologists interested in a fast-track introduction to machine learning techniques and their applications. It consists of brief hands-on lectures on key concepts such as supervised and unsupervised machine learning, overfitting in high-dimensional problems, regression and classification, pattern recognition and dimension reduction. These lectures will be complemented by interactive computer-based exercises in Python. The workshop concludes with a hackathon where participants can apply all new concepts in practice. Language: The lectures will be delivered in English; individual advice on the computer exercises can be given both in English and German. Prerequisites: Basic programming knowledge (not necessarily in Python) is a prerequisite. In general, participants should be able to read and modify pre-written code with additional support by the lecturer. 9.30-10.15: What is machine learning? Introduction to Jupyter notebooks and Python packages (scikit-learn, numpy). The bias-variance trade-off: short computer exercise on overfitting, high bias, regularization and cross-validation. Curse of dimensionality: issues encountered in problems with many predictors. How to apply regularization in high-dimensional space to avoid overfitting. Brief introduction to regression algorithms such as neural nets, random forests, Ridge regression. Examples: supervised classification in industry and research. How does supervised classification differ from regression? Jupyter-notebook: classification of meteorological events. Repetition: how does unsupervised learning differ from supervised learning? Algorithm examples: k-means clustering and principal component analysis. Jupyter-notebook I: PCA Varimax to identify global climate modes. Jupyter-notebook II (optional): clustering ocean circulation patterns. Research example: theoretical background on ozone and climate models. Jupyter-notebook: predicting stratospheric ozone using regression models and different input features based on dimension reduction approaches. Group reflection on approaches that worked or did not work. Why time series data is special. How specific machine learning algorithms can exploit time-structure in data. Computer exercise: auto- and cross-correlation of climate modes. Participants modify code to combine regression and dimension reduction methods. The aim is to improve the predictive skill given data provided for challenges (a), (b) depending on their choices for algorithms, tuning parameters and input features. Participants can work in sub-groups of two. Each group chooses either (a) or (b) first and will work on the other challenge in session 2. Participants return to the computer exercise and finish their first challenge. Teams swap topics (a) and (b). Each team/participant submits their best solution for challenges (a) and (b). The solution with the best generalization error on an unseen test dataset wins. Which parameters, input features appeared to be most important?